Writing had taken such a hold in my life, it was nearly impossible for me not to write. But at the same time, I wondered how I’d survive in an industry that felt like it was simultaneously sucking the life out of me. I think all artists go through this. Art of all forms is undervalued in our society. People pirate movies and songs and e-books and think nothing of it. Most people don’t pay for original, quality artwork to hang in their homes or offices. And a lot of readers sacrifice quality, edited literature for something cheaper. Because, let’s face it, we’d all like to get more bang for the almighty buck. Me included. The $500 painting pays for a plane ticket to see my kid. I’ll glance at that bare piece of wall for the rest of my life in exchange for a week with any one of my children. Maybe I’ll cover the blank space with a thrift-store cork board and some pictures from the trip. And $500 is cheap for an original painting. After another round of querying and another round of form rejections, I quit writing. I didn’t have it in me. The words were there, the worlds existed in my mind, and I went back to the stories in my head while folding clothing and doing the dishes. Life went on. “Was being the key word.” I folded my arms and clenched my jaw. He sighed and gave me a hug, kissed my cheek, squeezed me a bit harder even when my arms remained folded. And I cried. What if I was never published? I could write for me. Writing stories made me happy. And that’s what mattered. The next time I had a free moment, I sat down at the computer and started a new novel. And for the first time in years, I felt free. So how do we know when enough is enough? If you can quit writing and it doesn’t ruin you, do it. I say that with all the tenderness and care I possess. You might be unhappy with that notion or disagree with me, and that’s fine. Feel free. But after watching hundreds of published authors go through the process, I’ve learned what it’s like. If you don’t love writing and write for yourself, for the love of the words and the worlds and the characters—the struggle, frustration, and rejection will eventually leach out every other positive part of the writing process. You’ve got to have a passion that will sustain you through all the struggle to get published. You have to have it after you get published and don’t sell enough copies or get a hateful review or don’t sell the next book or don’t sell the next three. Even if you sell well and things go wonderfully, you have to love writing enough to find time to write while you’re marketing, promoting, editing the last book, and dealing with everything else in life. So, if you have to write, how do you know when your manuscript is ready to query? This is a complex question. Sometimes the answer is, you don’t. Most people don’t have enough money to hire a professional editor. That’s okay. I never did. So how do you figure it out on your own? Remember that you’re not alone. You have critique partners, hopefully, that will give you their opinion. They might be wrong, but it’s a place to start. Use contests like Pitch Wars and Author Mentor Match to submit as if you were querying and see what happens. They’re free, so no harm. Usually, you’ll get an idea of how well your manuscript is doing against the competition. These are a bit more helpful in that you can choose the mentors who read and write in your genre and age category just the way you would submit to agents. Again, don’t let that completely discourage you. Use them a gauge, not an end all be all. They can only accept one manuscript, where an agent can accept multiple. So you might’ve made the cut. And often, the mentor will tell you that or give helpful feedback. There’s also the free workshop, #1st5Pages. They take the first five people every month who submit and give a free critique of your pitch (the flapjacket or blurb part of your query) and your first five pages and let you revise a couple times in the process. Use critiques at conferences or online to see what industry agents and editors think of the manuscript. They do cost $40-$50, so it’s sometimes prohibitive, but paying a little can get you a lot of information. This is a career you might have to invest in, just like most people would pay for classes or training. Often, these conferences will offer ten page critiques. I’ve been both sides of the table here, getting critiques and then giving them. My advice: let yourself go through the grief process with them. You can get a little angry, feel hurt, let down, but give it a couple days and then go back and read the critique. Often, the agent or editor will have some great advice for how you can make your novel better. Use the querying process itself to see if you’re ready. Choose ten agents. Five who are young and hungry for manuscripts and five seasoned agents. If all ten are form rejections, there’s probably something wrong with your query, synopsis, or first ten pages. I’ve got a post on The Modern Query Letter here. And The Simple Synopsis here. Get help. Edit them. Have people read them. If they don’t understand anything in one single pass, make sure they tell you where they were confused. Get it as good as you can. (Don’t feel badly. I know plenty of published authors who need help because queries and synopses are so difficult.) Then query ten more as before. Still form rejections? Consider getting professional help–but make sure you do your homework! Not every freelance editor is the same. And often, your best bet is to go with an agent or editor from places like #MSWL Consultations. Agents and editors offer critiques, and they might like the premise enough to ask you to submit. If you need a cheaper option, go with a freelance editor who’s been in the query inboxes with agents as an intern and been groomed to read queries. Revise it. Soon, you’ll start getting requests. If you’ve done your best to revise and perfect your query and pages and you’re not getting any requests for more, you need to think about querying another novel. There is no magic number of queries to come to this conclusion. Hopefully, during this whole process, you’ve continued to write. Often, it’s not until the third, forth, or even fifth novel that a writer catches agent interest. Another thing, make sure the type of novel you’re querying is selling in the current market. As stated before somewhere (I think), what agents are signing is 18-24 months behind what’s hitting shelves. So they may know the market is saturated well before you do. My next post will be about how to follow the current industry sales and what’s being picked up now, so you as an author will be privy to what’s being scooped up. I personally don’t like the idea of writing for the market. It stifles originality and takes some of the joy out of the process for me. 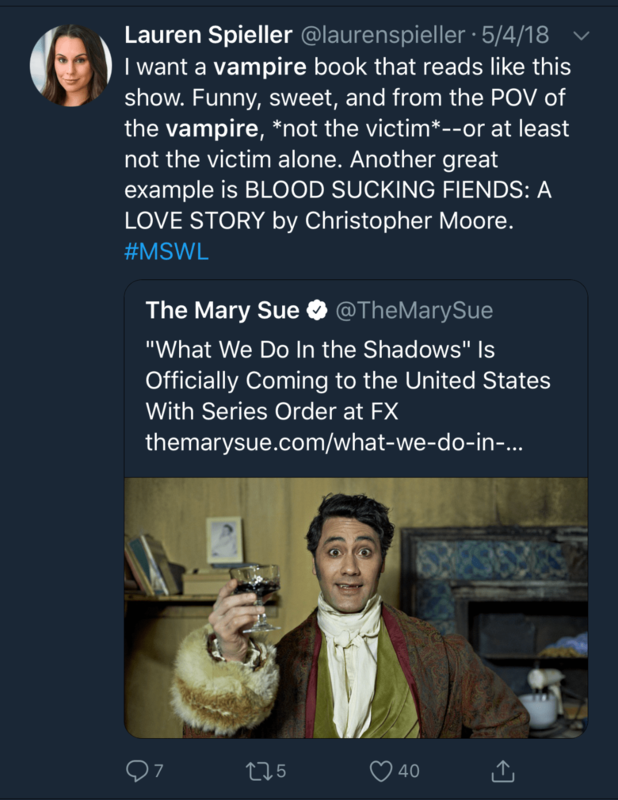 Either way, this information will make you a better judge of whether it’s your writing that needs improving, or whether you simply aren’t going to find a home for it because it’s a vampire novel and that trend is over. That said, it’s also you can dust off that vampire novel sitting in that file when an agent tweets out that they want to see those vampire novels again.